Merry Christmas! Hope your holiday is peaceful, joyful, and full of people and traditions you love. Thank you 🙂 It was a nice and quiet Christmas this year, which was just what I needed 😉 Hope yours where filled with loads of family and great food. Hope your day is Merry & Bright . . . and overflowing with Love & Light! Thank you, I had a nice Christmas. Hanging around the house, meals with friends, and even a few presents under the tree 🙂 Hope you have had a great celebration too… with family and friends. 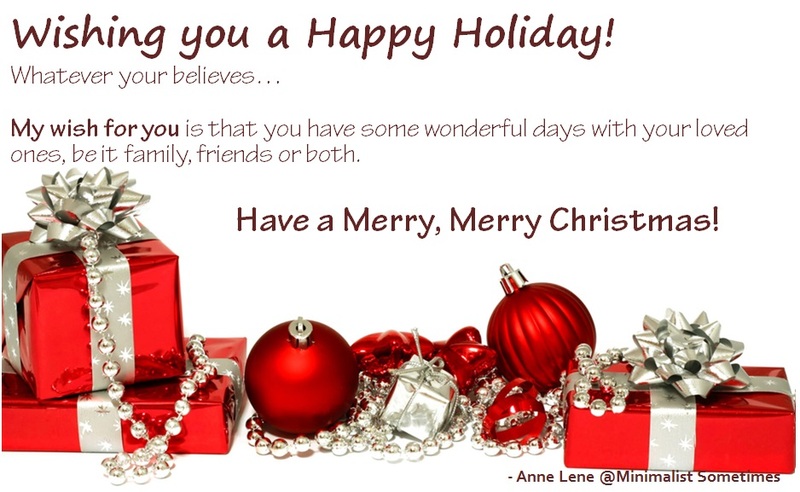 Merry Christmas to you Anne! My fiancée and I just watched an awesome documentary on minimalism on Netflix. We are both moving in that direction. I’m feels good! After watching it we did a purge! 21: – I think I jinxed it!